This view from NASA's Cassini spacecraft was obtained about two days before its first close pass by the outer edges of Saturn's main rings during its penultimate mission phase. NASA’s Cassini space probe has beamed back the first close up views of Saturn’s atmosphere. 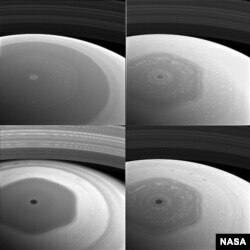 The images show the gas giant’s northern hemisphere, which is home to a hexagon-shaped jet stream. The current phase of Cassini’s mission, called Ring-Grazing Orbits, began November 30, as Casini started 20 week-long orbits that skim the planet’s rings. "This is it, the beginning of the end of our historic exploration of Saturn. Let these images, and those to come, remind you that we’ve lived a bold and daring adventure around the solar system’s most magnificent planet," said Carolyn Porco, Cassini imaging team lead at Space Science Institute, Boulder, Colorado. This collage of images from NASA's Cassini spacecraft shows Saturn's northern hemisphere and rings as viewed with four different spectral filters. Further ring-grazing will allow Cassini to take some of the “closest-ever” views of Saturn’s outer rings and the small moons in similar orbits. Cassini will make the orbits through April 22 when it makes a close flyby of the moon Titan. That plunge, also called the “Grand Finale,” will take the probe through the gap between Saturn and its innermost ring beginning April 26. About three weeks later, on September 15, Cassini will fly directly into Saturn’s dense atmosphere sending back data until the spacecraft breaks up. The Cassini probe was launched in 1997 and arrived at Saturn in 2004. Some mission highlights include the possible discovery of an ocean and hydrothermal activity on the moon Enceladus as well as liquid methane seas on Titan.